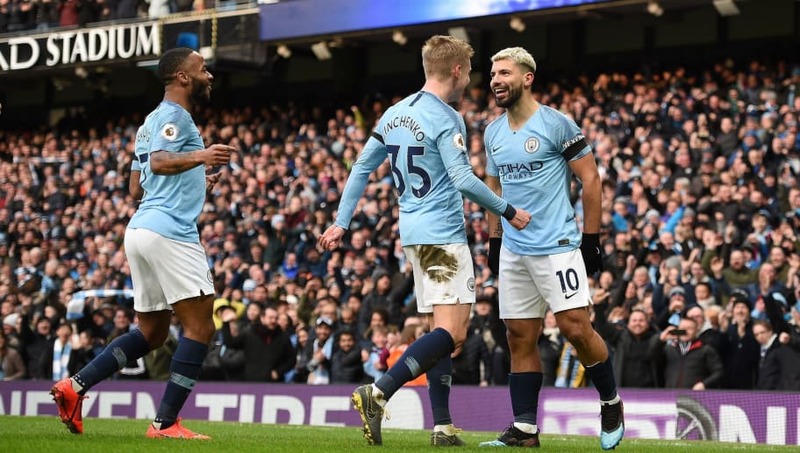 Manchester City returned to the top of the Premier League table in style, as they beat Chelsea 6-0 on Sunday afternoon. City took the lead after just four minutes, as Chelsea's defence was cut open and Raheem Sterling fired home. Sergio Aguero had a golden opportunity to double their advantage minutes later, but remarkably missed an open goal from just yards out. Aguero redeemed himself just five minutes later with an absolutely beautiful strike. The Argentine picked the ball up on the edge of the box and delightfully curled it into the top corner, giving Kepa Arrizabalaga no chance. Aguero scored his second six minutes after his first, as Ross Barkley headed the ball straight back into the box to put it on a plate for him. City made it 4-0 in the 25th minute, as Ilkay Gundogan found acres of space on the edge of the box to guide the ball into the bottom corner. Aguero completed his hat-trick in the second half with a cool penalty, after Cesar Azpilicueta brought down Sterling. It was the Argentine's 11th Premier League hat-trick, putting him joint-first with the league's all time leading goalscorer Alan Shearer. Sterling scored his second of the game in the final ten minutes, as he made it 6-0 with his 12th league goal of the season. It wrapped up an incredible performance from Manchester City, as they returned to the top of the table in style. Here's our breakdown of Sunday's ​Premier League clash. Manchester City were sublime on Sunday, producing a trademark performance to leapfrog ​Liverpool once again, albeit with a game in hand. They were outstanding throughout the game, dominating from start to finish and didn't put a foot wrong in a flawless performance from the reigning champions. With the pressure on as usual they didn't falter once, as Pep Guardiola did everything right. It was wonderful football from the Citizens and they produced another statement win in their pursuit of back-to-back league titles for the first time in their history. Starting XI: Ederson (7); Walker (7), Stones (7), Laporte (8), Zinchenko (7); Fernandinho (8) Gundogan (8), De Bruyne (8); Sterling (9), Aguero (10*), B. Silva (8). Substitutes: Jesus (6), Mahrez (6), D.Silva (6). STAR MAN - It was yet again another perfect performance from ​Sergio Aguero, as he registered back to back hat-tricks in home league games. Aguero was ruthless against Chelsea, scoring his fifth goal against the Blues this season following his brace in August's Community Shield win. He also drew level with the great Alan Shearer, as he scored his 11th Premier League hat-trick as well as bringing his season tally up to 23 goals in all competitions. The Argentine was a worthy man of the match, as he continued to prove himself as one of the best strikers around. ​Chelsea were dreadful, shambolic and embarrassing at the Etihad. Just a week after their emphatic ​5-0 win over Huddersfield, the Blues were demolished by a ruthless City side and, although the hosts were fantastic, it was simply unacceptable from Maurizio Sarri's side. It was always going to be a big ask for Chelsea to beat the reigning champions on their own turf, but to lose in such humiliating fashion is not good enough. Two defeats, zero goals scored and ten goals conceded in their last two away games is shameful - they'll need a huge response. Starting XI: Arrizabalaga (6); Alonso (4), Luiz (5), Rudiger (5), Azpilicueta (4); Barkley (4), Kante (5), Jorginho (5); Hazard (6*), Higuain (6), Pedro (5). Substitutes: Kovacic (6), Loftus-Cheek (6), Emerson (6). STAR MAN - There was little to no quality in Chelsea's performance, but in fairness ​Eden Hazard did try to salvage something. Although he got no reward for his work he gave the Blues their best attacking chances of the game, but nevertheless wasn't up to his top standard. ​Manchester City are in FA Cup action next, travelling to face League Two side Newport County next Saturday. They then play the first leg of their Champions League round of 16 tie, as they face ​Schalke on 20 February. Chelsea are in Europa League action next Thursday, when they travel to Sweden to face Malmo in the round of 32. The Blues then face a huge FA Cup fifth round tie, as ​Manchester United visit Stamford Bridge on 18 February.